Once upon a time (a not so distant past as a matter of fact), Sabah was still part of the official map of the Philippines. There were no explorations yet as to its potential vast resources like oil. Philippine government at that time was still naïve and almost innocent on the ways of the world. It was more concerned with personal turf and only a token interest in national development. Philippine needs then were so simple and unsophisticated. And then the world became aggressively involved in materialism and power. The Philippine government was caught napping in the panciteria. As it awakened from its slumber, Sabah was no longer there. And the Philippines was overtaken by events and became almost overnight the sick man of Asia. The election fever is, well, feverish and on higher pitch with casualties numbering more than 50 already (27 killed, 24 injured) since the January 13 season began this year. And at the rate politicians would offer pie in the sky to their voting constituents, the country is shrinking physically because of mediocre leadership. 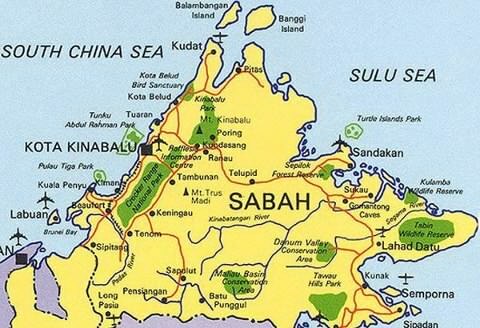 First, Sabah was removed from the map (to reclaim it is now considered criminal); then, the Spratlys was introduced in the map of China already. Politicians would take as a great challenge anyone who reduces their PDF or allowances (some would even besmirch their own colleagues to high heavens) but would not be heard, even a whimper, when their own country is decapitated from its original size. It has been said that in Asia, the Philippines was the first to assert independence from ruling foreign invaders. The brightest (Rizal) and the bravest (Bonifacio) were there at the forefront. They were eventually taken over by people who compromise a lot. They come not from the ranks of philosophers or warriors, but from entrepreneurs and the industrial world. Where there is material gain for them, they are there. For their constituents and their country, for them, its Bahala na si Batman! AT A GLANCE: Greetings to Mr. Greg Josue and Mrs. Ansia Josue, my uncle and aunt, take good care of your health always. OFW remittance increased 8% this year. Sikap at tyaga and a lot of painful sacrifices are propping Philippine economy. Pope Francis is the eldest of 5 siblings and is known by his passionate concern for the poor and marginalized. Two senators—Santiago and Lacson—at war and hugging the headlines, eclipsing senatorial candidates in terms of media space. And yet, these two are not even running for any post.